Heron Cottage, Robin Hill Farm Cottages in Nr Bideford, Devon sleeps 6 people. Robin Hill Farm is set in 14 acres of beautiful rolling countryside in the North Devon biosphere. The six properties (refs FKH, HBBZ [Gull Cottage], FAD [Puffin Cottage], FAE [Wren Cottage], FKJ [Swallow Cottage], FKK [Kingfisher Cottage]), converted from stone farm barns and buildings, are centred around the old cobbled farmyard. The location offers a peaceful and secluded setting away from the daily hustle and bustle, yet it is only 3 miles to shops, entertainment and the beach. Inside the holiday cottages are well furnished and provide a relaxing haven after a long day sightseeing, walking, cycling or on the beach. 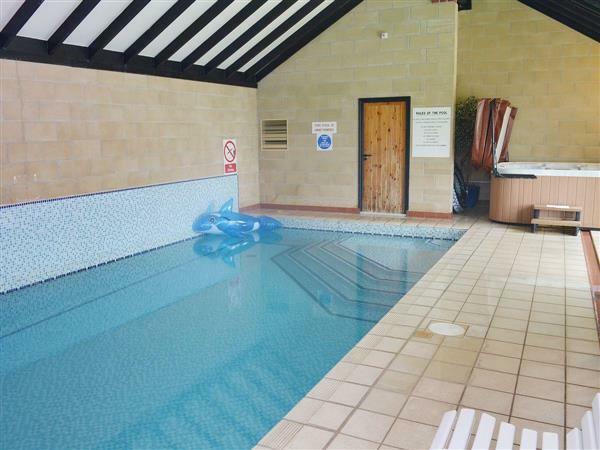 The heated indoor swimming pool room includes a hot tub and a stunning conservatory attached. From the conservatory and decking area guests can enjoy the beautiful views over the valley towards Exmoor, whilst drying off or enjoy a coffee or glass of wine no matter what the weather. There is a very well equipped games room for all ages and for big and little kids video games can be enjoyed on a 60in plasma screen. Outside the grounds have been landscaped to create two play areas, one with ball games, the other with playhouse and climbing frame. A communal patio means that adults can relax whilst watching their children play. Guests can enjoy the farm’s 14 acres of land and woodland walk which are host to a variety of wildlife and wild flowers with lovely views of Jennetts Reservoir. Nearby there is plenty to keep visitors busy. Many quaint villages await discovery - the photogenic ‘chocolate box’ village of Clovelly being of particular note. Appledore offers all the olde worlde charm of a fishing village, famous for its arts, crafts and maritime heritage. Beach lovers will delight in the wide sandy beaches, the nearest being Westward Ho!. Walkers can enjoy the spectacular scenery of the coastal path, while the Tarka Trail traces the steps of Henry Williamson’s Tarka the Otter and provides miles of traffic-free cycling (and walking) - bikes can be stored securely or hired locally. Award-winning farm parks, The Milky Way and The Big Sheep, will fascinate the younger ones. Gardens within 30 minutes’ drive include RHS Rosemoor, Docton Mill and Tapeley Park. Several local pubs nearby, with the nearest in Littleham village serving real ale and home cooked food. Shops 3 miles, pub 1½ miles. This charming cottage has its own south-facing secluded patio and garden. Open-plan, beamed living room with electric ‘wood burner’ and fully fitted kitchen/dining area. Entrance hall. Bunk-bedded room. First floor: Two bedrooms; one double (5ft bed) and one twin-bedded. Bathroom/W.C. with over-bath shower. For a better idea of where Heron Cottage is, you can see Heron Cottage on the map below. Heron Cottage is in Devon; should you be on the lookout for a special offer, you can find all the special offers in Devon. It's always worth checking to see what is on offer at the moment. Do you want to holiday near Heron Cottage (FKH), you can see other cottages within 25 miles of Heron Cottage; have a look to find your perfect holiday location.